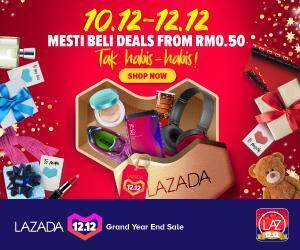 In line with the Astro Radio localization efforts, ERA fm is extending its local hours from 10 hours to 12hour with a nightly segment on weekday commencing 12 October 2015. The night segment will be hosted by Fir Affandi, a 26 year old local born model, singer and actor and he is also known as one student of the Akademi Fantasia 9. Sarawakian will be entertained with more segments specially catered to and new features will be introduced into the night segments by having more interaction with its listeners. A local chart show; spinning top 40 songs voted by listeners via www.era.fm and listeners gives a chance to share what they want to hear out of the CARTA ERA KAMEK. In addition, ‘Kaki Poret’ is a feature for listeners to write in to the artistes and selected question and answer by the artistes will be aired. Listeners on weekdays will continue to flare with more music by Chopie from 10 am to 2pm with ‘Ohaa ERA’ and from 2pm to 4pm with Osha on H! 20 ERA for more entertainment thrill. In the evening, the Osha and Afick will lighten your evening with more LIVE updates and fun features with ‘Lagu Gostan and KanDahKenak’ on ‘Petang ERA’ from 4pm to 8pm. On the weekend, Syazz & Michelle will groove with ‘Sabtu Pagi ERA’ from 7am to 9am. Followers of the local flavors, wouldn’t want to miss Carta Borneo ERA brought to you by Leema with Chopie from 9am to 10am and last but not least, listeners who miss the weekdays feature can catch up Ohaa ERA with Syazz & Michelle from 2pm to 6pm. Spice up your day with ERA fm 96.1fm, Kuching and 101.3 fm, Miri. 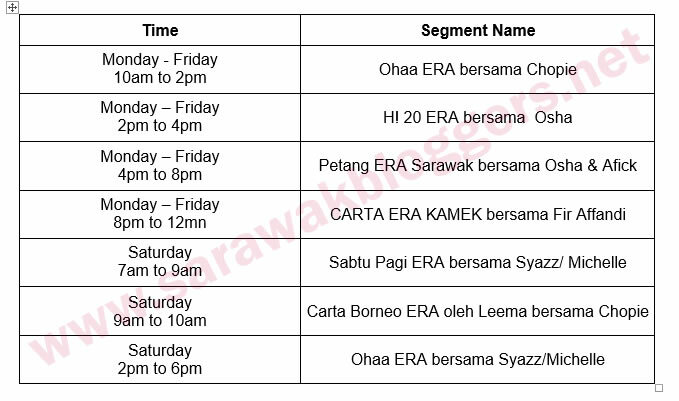 Below is the full schedule for ERA fm Sarawak.